Nothing could be grander or more impressive than three dozen premium, long-stemmed red roses in a striking glass vase. This stunning bouquet combines the freshest available roses with classic greenery, making a dramatic impression for life's most special occasions. 36 Red Long-Stemmed Roses (60 cm). Lush Greenery including Salal, Ruscus and more. Standard Arrangement Measures 34" x 30". Three Dozen Red Rose Bouquet is a hand delivered gift. These gifts are delivered by one of our local design centers located throughout the United States and Canada. Same day delivery is available for most gifts when ordered before the cutoff time. 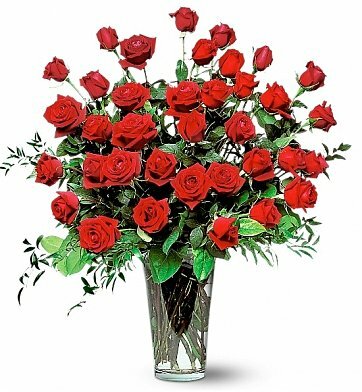 The cutoff time for Three Dozen Red Rose Bouquet is 2 PM in the recipient's time zone. Excellent bouquet, delivered right in time - I'm very happy. Thank you very much. Great job guys & thank you! I remembered an important date the night before and was able to select and deliver the perfect gift before 2:00 pm the next day. Thanks Giftree....you are the best.